In mid-November, Boston’s local CBS affiliate announced Bostonians should expect a “snowier and colder than average” winter this year. It’s estimated we’ll receive at least 65 inches of snow at Logan Airport, and that number may substantially rise depending on the El Niño factor. 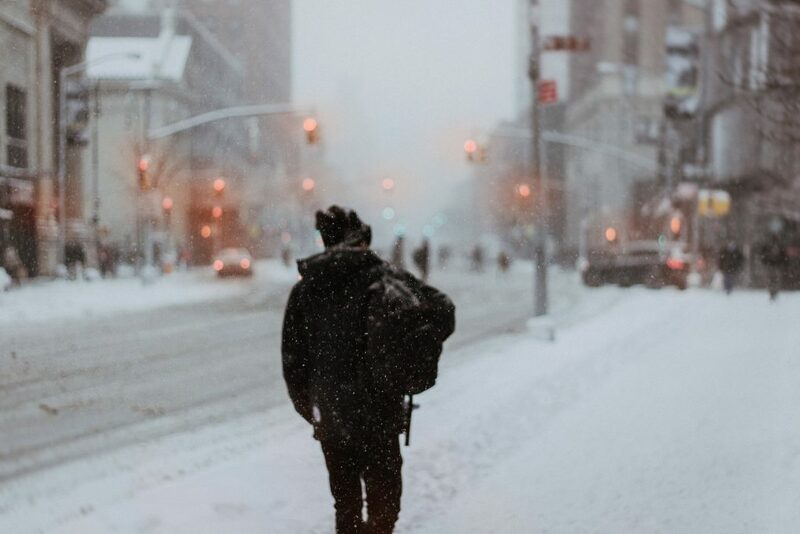 Knowing that we’re in for a cold and wet winter, it’s important to remember sidewalks, steps, and footpaths will require extra care and attention from property owners to prevent sidewalk slip-and-fall injuries. Who Is Responsible for Snow and Ice Removal? Under Massachusetts law, property owners are obligated to provide a safe walkway for people who are visiting their property, regardless of weather conditions. This includes snow and ice removal within a reasonable amount of time. Shoveling walkways and steps, as well as applying salt or a chemical deicer as needed, is the responsibility of property owners. This includes both residential and commercial properties. In the case of a rental property, the owner might have included a clause in the lease agreement that the tenant is responsible for snow and ice removal while renting the property. For public property, the city is responsible for maintaining sidewalks, which includes the removal of snow and ice within a reasonable time period. Soft Tissue Injuries: These injuries are often undetectable at first glance, making them difficult to diagnose. While being bundled up for the cold weather may help cushion the impact, injuries to wrists or ankles may worsen over time. More serious damage could result from torn tendons and ligaments, which will require timely medical attention. By seeking out a doctor’s diagnosis of your injury, you’ll have documentation proving your injuries are significant, which should prove helpful if you seek legal action against the party you feel is responsible for your fall. Head Trauma: Even a slight impact to the head can result in potentially serious trauma. Anytime you fall on snow or ice and hit your head, you should immediately seek medical care. Swelling, bleeding, or even a momentary loss of consciousness are all signs of a potentially life-altering traumatic brain injury. Some head injuries present little or no indication of damage until hours or days later, which could appear then as a life-threatening event. Always seek a full medical evaluation after any head injury. Broken Bones: In most cases, broken bones are painful and it’s apparent you’ve sustained an injury. However, in some cases the pain might not be as significant, and you might dismiss the break as a relatively minor injury. This can prove detrimental for your recovery. Immediate medical treatment will provide the best outcome for your long-term healing, and will also provide documentation of the fracture you sustained as a result of your fall, strengthening your personal injury claim. Most people who slip and fall in winter weather make an attempt to get back on their feet. This could be due to the cold snow or the desire to not become wet while lying on the ground. In some cases, embarrassment drives a fall victim to try to spring up as if nothing has happened. But getting back on your feet is not always a good idea, and it could lead to more injuries. After a slip-and-fall, take a moment to gather your thoughts, and allow your head to clear from the burst of adrenaline your body just experienced. Next, try some slight movement of your extremities to test for injuries. If you are having difficulty thinking or have blurred vision, do not attempt to stand up, as you could easily fall again and sustain additional injuries. If you think you have injuries, call 911 or ask someone to make the call for you to request immediate medical attention. Even if you believe your fall resulted in minor bumps and bruises and your pride sustained the greatest injury, it is important to get checked out by a doctor. Some injuries, including serious internal ruptures, can be difficult to detect immediately, whether due to the cold weather or a combination of shock and adrenaline. If your fall occurred inside a property, the owner could still be at fault for your injuries. During winter, floors can become slippery, as can interior steps. Property owners have a responsibility to provide rugs or mats to absorb moisture as well as secure handrails for all steps. If you believe your Boston slip-and-fall accident was due to a property owner’s negligence, please call DiBella Law Offices, P.C., at (978) 327-5140 to schedule a free consultation. Our Boston premises liability lawyers have over a decade of experience assisting victims like yourself, and we will help you get the compensation you are entitled to.